The Browns team was one of more about 100 teams that took part in Walk MS: Antelope Valley Saturday. 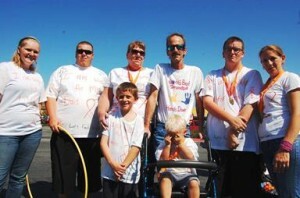 LANCASTER – Local mechanic Joe Perrin could barely contain his emotion as he spoke of his family’s decision to participate in Walk MS: Antelope Valley. 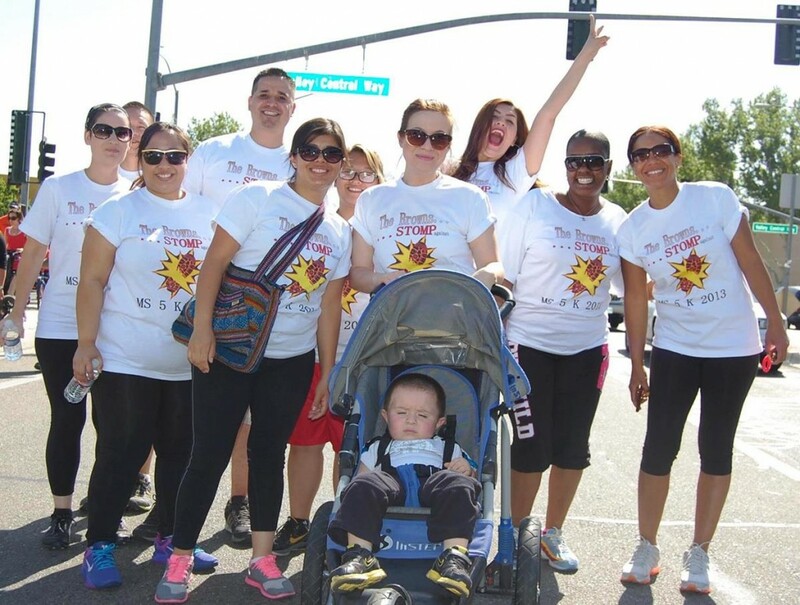 Perrin’s family joined hundreds of participants Saturday morning for Walk MS: Antelope Valley, the annual event that raises money and awareness for the thousands of local residents affected by multiple sclerosis. The event kicked off around 9:30 a.m. Saturday with opening ceremonies at Lancaster Marketplace. Sherry Prieto won the Most Inspirational Walker Award for the second straight year. Two participants were chosen for volunteer and inspiration awards. The 2013 Most Valuable Volunteer Award went to Michelle Webb from Northrop Grumman, who was participating in her fifth straight Walk MS in the Antelope Valley. 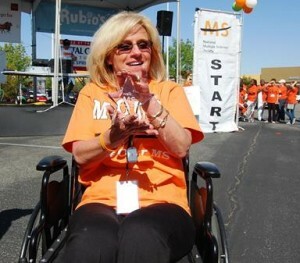 Sherry Prieto of MOMS – Move Over MS won the Most Inspirational Walker Award for the second straight year. After opening ceremonies, the massive crowd took to the streets of Lancaster. Participants had the choice of two routes: a 1K walk headed south on Valley Central Way to Avenue J and then north on Valley Central Way back to Lancaster Marketplace; and a 5K walk headed west on Lancaster Boulevard, south on 32nd Street past Lancaster High School, east on Avenue J to Valley Central Way and then north on Valley Central Way back to Lancaster Marketplace. Jose Gutierrez, who recently ran the Boston Marathon, was first to cross the finish line. When participants crossed the finish line, they were greeted with hearty applause and awarded medals by members of Dazzler Cheer. “We directly don’t have anybody that has MS in our group, but we thought it would be a great opportunity for our girls to get out in the public and show their support for this cause,” said coach Jennifer Elizondo. Joe Perrin and his family. Among the first teams to cross the finish line were the seven members of the Perrin family. Joe Perrin joined Dazzler Cheer in greeting his family at the finish line. Funds raised from Walk MS: Antelope Valley will benefit the Southern California & Nevada Chapter of the National MS Society. For a complete list of teams that participated in Walk MS: Antelope Valley 2013, click here. For more information on multiple sclerosis, the National MS Society and how you can support this cause, call 800.FIGHT.MS or visit www.nationalMSsociety.org/cal. From more sights from 2013 Walk MS Antelope Valley here. 3 comments for "Walking together to create a world free of MS"
I very thankful that everyone is learning about the MS. Not many people are ware of the “Disease” nor do they have the awareness that they should have. This was a very informative day for my family and I. 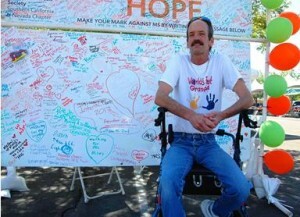 My dad Joe Perrin, was diagnosed with MS and interviewed it has brought us closer as a family. It made us aware of the MS and we can do to help others. viewed on sat. thank you so much and we look forward of seeing you next years walk.